I was pretty sure that when I moved to New York, at least 10 pounds were going to melt off of me with very little effort on my part. I knew I would be walking everywhere instead of driving and I guessed that the heat and humidity would be enough to serve as my own personal sweat lodge. This may be true for some new inhabitants of New York, but not for me. If, like me, you happen to be attending culinary school, The French Culinary Institute in particular, then the increase of butter and cream in your diet is enough to offset any good that pounding the pavement of New York might have done. Needless to say, when I am not in school, I am doing my best to keep my meals on the lighter side. These nori rolls have become one of my go-to snacks. I eat them like hand rolls, but I have also been known, in my lazier moments, to thrown some brown rice in a bowl, top it with veggies and use a sheet of nori to scoop everything up with my hands. These are delicious and good for you either way. Also, if you happen to be in culinary school, they have the added benefit of using up all those julienned vegetables you have laying around if you have been practicing your knife skills. If you haven’t been practicing, these rolls will give you a great excuse to start. Toss the brown rice with the fish sauce and set aside. If you just cooked the rice, let it cool before assembling the rolls. Cut one sheet of nori in half lengthwise to make two strips. At one end of each strip of nori, pile 1/4 cup of rice, leaving the bottom corner of the nori sheet exposed so you can use it to start rolling. 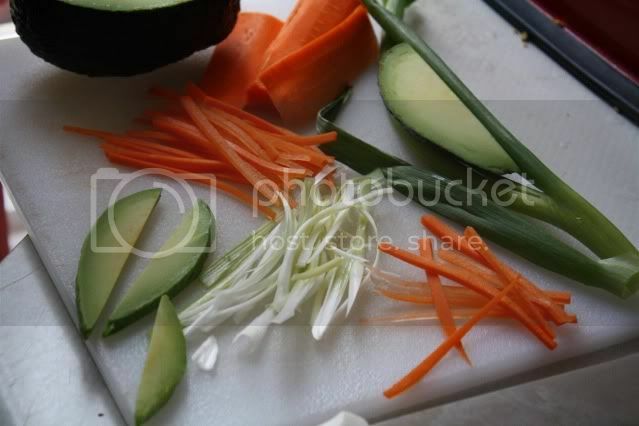 Place a quarter of the julienned carrots and green onions on the rice on each sheet along with one or two slices of avocado. 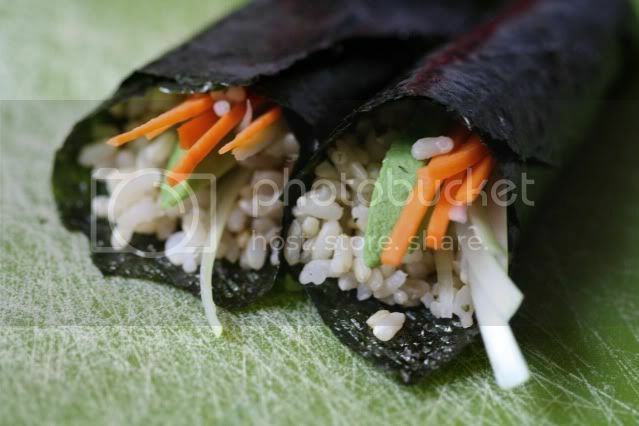 Fold the bottom corner of the nori sheet over your pile of rice and vegetables and continue rolling the sheet into itself until you form a hand roll. Use a bit of water to moisten the end of the nori sheet to get it to stick to the roll. A bit of brown rice may fall out as you are rolling. Just tuck it back in to the roll when you are finished. I eat these plain, but you may also serve them with soy sauce or extra fish sauce for dipping. This looks awesome! Next time I even consider take out, I'm going to prepare this. So delicious, figure friendly and affordable. Healthy and delicious. I shall try it. Um. I could eat a dozen! Such lovely julienned vegetables. These look perfect for summer. Thanks! Culinary school sounds fun even with an overload of butter and cream. It looks like you've certainly perfected the art of julienned vegetables! Your nori rolls look the perfect antithesis to cream and butter and a great snack. I might just give them a try. I think it would be wise that I first start working on my knife skills though! Wow...what a great looking way to counteract the cream and butter. Momma I feel you with the butter and cream. Soups, stocks and SAUCES was an eye opener class Chef: Maybe we add some butter....maybe a litle bit more(as at least a 1/4 pound goes into the demi glace...)! P.S. Your Juliennes are gorgeous! I think I need a practice session! if there's one thing to love about you going to school, it's that you're posting more often. can't wait for your inside stories! japanese is not my thing at home, but this looks basic enough even for me. thanks! These look so pretty! I've been addicted to summer rolls for the last few (hot!) weeks. 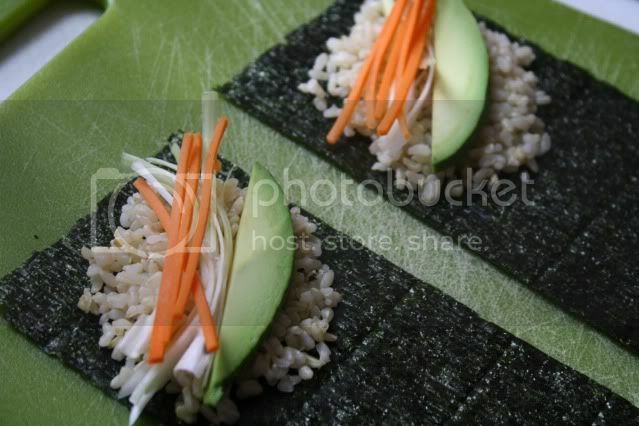 Same exact idea, but with softened rice paper instead of nori. Yum! Your nori rolls look great but your knife skills are awesome. What a great snack. I really could benefit from a knife class. This looks cook easy. i think I can do.